"If I live with these people, I'll become weird too!" For those with multiregion capability, Odex Private Ltd. brings another full series to DVD in this six-disc, 24-episode, subtitle only release of Love Hina, based on the 14 volume manga by Akamatsu Ken, which won Kodansha Manga of the Year award for its creator. When he was very young, Keitarou Urashima (Yuuji Ueda) made a promise to a girl he met one summer on the playground near his grandmother's hotel: one day the two of them would get into Toudai University together, which, as the story goes, would let them live happily ever after. After failing miserably on his first two attempts at the entrance exam, his prospects of living up to his promise are growing thin. His parents think he should give up, still, even though he can't remember much about her, he believes that his destiny lies with that girl from long ago. When his grandmother invites him to stay at the Hinata Hotel, he will once again have the chance to fulfill his lifelong dream. Little does he know the Inn is now a girl's dormitory, but without an innkeeper, its residents may be forced to leave. The misunderstandings begin immediately—after arriving to an empty building, Keitarou decides to relax in the hotel's hot springs. When the girls show up to do the same, they think he is a pervert, and set out to clobber him for his nasty habits. Then, after the intervention of his Aunt Haruka (Megumi Hayashibara in an atypical role), the girls wind up believing he is a Todai student already. Much to the lady's objection, and Keitarou's surprise, it turns out grandma has handed him the job of keeper. Despite his best intentions and sincere innocence, he becomes the brunt of each girl's affections and disapproval, with often painful consequences. Love Hina follows in a long line of romantic comedies, but manages to use the clichés to its advantage. The story is full of ups and downs, with often predictable turns of events that keep the misunderstandings mounting. Although most of these don't lead to many huge surprises, there are still a number of unexpected twists that add to the complexity of the character's dilemmas. The series does contain a number of filler episodes, but even when the plot isn't moving forward, the character development is still in play, and this is where the show's real strengths lie, as the characters are what keep this series so interesting. While borrowing from its predecessors, Love Hina presents a diverse and very funny cast. Keitarou is a fairly typical shounen male, surrounded by women, and managing to screw up his chances at a relationship. He is attracted to Naru (Yui Horie), who he first believes is the girl from his past, but circumstances cause many misunderstandings between the pair. Naru likes Keitarou as well, but she has a jealous streak that finds her sending the boy flying with one of her enraged attacks more often than building a romance. Her jealousy is instigated by the arrival of Mutsumi, a bright girl who is also a retaker, plagued with a mysterious illness that causes her to faint unexpectedly, and also forget things a lot. Motoko Aoyama (Yuu Asakawa) is the resident ninja girl, vehemently swearing off men as the inheritor of her family's tradition with the sword, simultaneously repulsed by and drawn to Keitarou. Like Naru, she is responsible for frequent attacks on her keeper, and the Tokyo skylines are often dotted with Keitarou's silhouette flying across the heavens as a result of her assaults. Motoko also has a morbid aversion to turtles, though the translation here (as is the case with the US release) misses its true ramifications. Mitsune Konno (Junko Noda) may or may not be after Keitarou, but she is full of mischief, and her schemes rarely benefit the male of the household, even if they are intended to. Of the younger girls, Shinobu Maehara also has a crush on Keitarou, but her youth gives her a much more innocent perspective on her sempai. She is played to perfection by Masayo Kurata, who brilliantly conveys the girl's emotional flux, trying to combat her shyness while agonizing over the pivotal moments in her young life, such as the correct circumstances for her first kiss. Shinobu wants Keitarou to be happy, but can't help feeling jealous when his attentions for another girl become obvious. Su Kaolla (Reiko Takagi) on the other hand is a rambunctious troublemaker, who harnesses some strange mystical powers, and a limitless supply of energy—she also sleeps in a tree and is obsessed with food. Those familiar with the character Tanya from Battle Athletes will recognize a distinct similarity. Sarah Macdougal (Yumiko Kobayashi) shows up midway through the series, adding yet another thorn in Keitarou's side, as the ward of an archaeologist, Matsumoto Seta, who was also the object of Naru's affection when she was younger. Throw in a flying turtle (who inspires a mecha army), some supernatural combat, and a few mysteries, and you have the recipe for a great show. 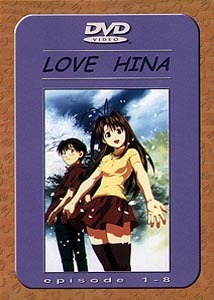 While it covers a lot of familiar ground, and pays homage to many older shows in the process, Love Hina has its own unique charm, extremely likeable characters, and an enjoyable plot. The artwork is wonderful, being very fluid in the animation. The series also makes great use of its musical soundtrack, which really adds to the mood throughout. It isn't without fault or the odd diversionary installment, but as the final credits rolled, I was wanting for more. With a great blend of warm romance, riotous comedy, and impossible action, Love Hina is a hands down winner. Image Transfer Review: Video quality is extremely good throughout, aside from some minor shimmer on occasion. Colors are vibrant or subdued as appropriate, blacks are deep and solid, and clarity is excellent. No complaints in this department. Audio Transfer Review: Stereo Japanese audio is full sounding and features a decent stereo soundstage. Directionality is well utilized when appropriate. no distortion or other technical deficiencies were noted. The title track is quite aggressive, with less width than the rest of the show. Extras Review: While lacking any series specific extras, one interesting bonus is the inclusion of the complete collection of Dolby Digital trailers, one per disc. The menu for each disc also uses a different background song from the series. A "play all" feature or chapter stops for the beginning of each episode are included, though each episode has additional chapters in the usual places. Like all the Odex releases I've seen so far, the only major shortcoming in the programming is in the subtitles, which are prone to having English tense problems, and the odd spelling mistake. None of these should detract from the intended meaning, but they do feel awkward sometimes. There is one technical glitch in one line on the episode 15 (disc 4) where the subtitle is too low and will get cut off on most sets. The set is packaged in three clear double Amarays. I'm not too keen on the cover designs, but the inside features a collage of screen captures, and each case contains the translated lyrics to different songs, which aren't subbed on the disc (the title track is sung by the cast in a later episode, so does get translated there). Love Hina is an extremely enjoyable series, with great characters, hilarious situations, and a decent resolution. The video and audio quality here is excellent, and I especially like the fact that these Odex releases contain the TV show in its entirety. If you require a dub, or are picky about subtitle accuracy and packaging asthetics, then this version may not be for you, but for everyone else this is a bargain if you can overlook the few minor imperfections. Love Hina rocks!